Watch This offers movie recommendations inspired by new releases or premieres, or occasionally our own inscrutable whims. The summer movie season is upon us, which means it’s time for a semi-annual tradition: singing the praises of the most unloved, underperforming, or simply forgotten summer blockbusters. 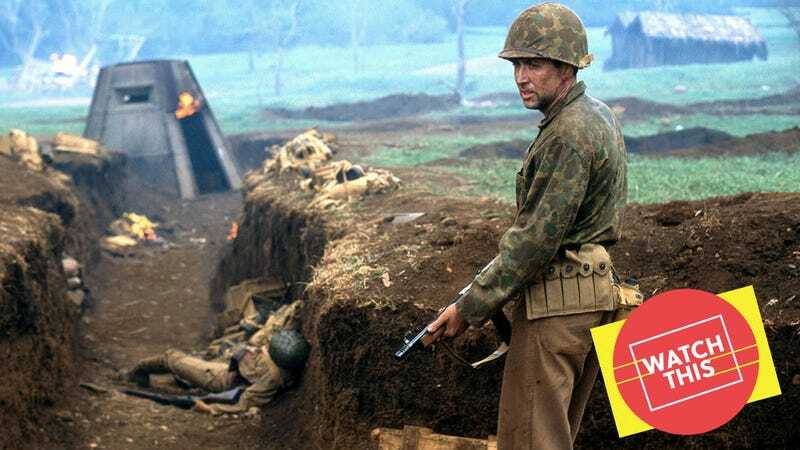 Windtalkers was never meant to be a summer blockbuster. Sure, it had an enormous budget ($115 million, which is closer to $165 million in today’s dollars) and a pyrotechnic maestro behind in the camera: the flamboyant Hong Kong and Hollywood action director John Woo. Woo had made a gazillion with his last film, Mission: Impossible 2, and was reuniting here with Nicolas Cage, the star of his transcendently campy summer hit Face/Off. But until the events of 9/11 made American studios rethink their release schedules, it was meant to be a 2001 awards-season release, more earnest war movie than shoot ’em up entertainment. Moved to the summer of 2002, toward the end of a period when Hollywood was oversaturated of World War II epics—a cycle kicked off by the success of Saving Private Ryan—it flopped, opening third behind Scooby-Doo and The Bourne Identity. Though it seems unlikely that even the film’s release date could have saved it from commercial failure. On paper, the problems with Windtalkers are much more obvious than its qualities—the most obvious being the fact that it’s a movie about Navajo code talkers that stars Nicolas Cage. The code talkers were speakers of Native American languages who were enlisted to send messages between United States forces during World War II; the hundreds of Navajo speakers who served in the Pacific theater of war are the most famous, though many languages were employed in both the Pacific and in Europe. On top of communicating in languages that were more or less indecipherable to non-speakers, they spoke in a code that was committed to memory, making it impossible to decipher their transmissions. In a confusingly restrained performance, Cage plays Cpl. Joe Enders, a half-deaf Marine who is assigned to protect a young Navajo code talker, Pvt. Ben Yahzee (Adam Beach), during the invasion of Saipan. (The story goes that Cage went so far as to learn Navajo his the role, possibly in the mistaken belief that he was playing one of the code talkers; it sounds farfetched, but considering that Cage is one of the strangest people to ever become an A-list Hollywood star, one is almost inclined to believe it.) Because he’s really just a secondary character in a story with inherent dramatic and historical tensions that don’t have much do with him, Enders makes for an awkward protagonist. So Windtalkers wholly invents some extra friction: He’s been secretly ordered to kill Yahzee if there’s a possibility that the code talker might be taken prisoner by the Japanese. It should be noted here that Windtalkers’ military tactics are about as grounded in reality as the police operations in Hard Boiled. It’s Woo-land, a violent ballet of automatic gunfire and figures flying through bushes and smoke, seen from multiple angles and in slow-motion. This wasn’t the first time that the director had applied his heroic-bloodshed theatrics to a wartime setting. In 1990, he’d made Bullet In The Head, which was sort of like his answer to The Deer Hunter, a violent Vietnam War melodrama that had started out as a prequel to his breakthrough hit, A Better Tomorrow. But the scale of Windtalkers—something of a precursor to his subsequent Chinese historical epics Red Cliff and The Crossing—is much larger. Though the combat sequences never rise to the shock or lyricism of Private Ryan’s D-Day, there’s still something swoopingly awesome about seeing Woo direct World War II as an outrageous scrimmage of John Woo shootouts. The film’s attempts at battlefront humanism in the vein of Samuel Fuller is more ham-fisted than two-fisted. (Fuller, for one, would have probably made Yahzee the main character.) But the clumsy sincerity of this story of men learning to see each other as something more than orders is never in doubt. Despite its flag-waving Americana (complete with a James Horner score), Windtalkers has more in common with Woo’s Hong Kong work than his campy American action movies: It’s an unapologetic macho weepie set against a backdrop that Woo treats as the ultimate blood opera. It’s just that the backdrop is more compelling than the sentimentally underwritten characters. There’s more transcendent corniness in a single shot of a butterfly fluttering over a stream running red with blood than in all the dialogue combined. Which is to say that it’s better and more interesting than its reputation suggests (and a fascinating item for the director’s fans), but should still be approached with realistic expectations—though, ironically, realism is the last thing one should expect from a war movie by John Woo. Availability: Windtalkers is available to rent or buy through all the major digital services. It can also be obtained on DVD or Blu-ray from Netflix, Amazon, or possibly your local video store/library.